My paternal Cooper family has seen me reach back to my 6x Great Grandparents, Charles Cooper and his wife Martha Harte who lived in the city of Ely in Cambridgeshire, England during the early 18th century. However, my most recent Cooper ancestor was my Great Great Grandmother Harriet Cooper who was born in Ely in 1854. In the 300 years since Charles and Martha Harte were married there in 1716, Ely has been home to at least 5 generations, with my Cooper ancestry ending when their Great Great Granddaughter (and my Great Great Grandmother) Harriet married my Great Great Grandfather Alfred Newman in 1877. However, Harriet was not alone. Her parents Robert Cooper and Elizabeth Fison had 13 children between 1829 and 1854. Harriet was the youngest. Robert was a shoemaker - a career that lasted him at least 52 years as he remained living in Ely. Unlike Robert, and Harriet, Ely was just not big enough for the whole family, and therefore many of them moved away, leaving Harriet to watch over her ageing parents right up until their deaths in the late 1880s. It's known that most of Robert and Elizabeth's children left Ely. At least six moved down to London, where they lived and worked in the St. Giles and Bloomsbury areas, including John Cooper who became a mechanical engineer. Others headed to Cheshire, Essex, and Bedfordshire, and one moved to Western Australia. One of the Ely-based Cooper family - Charles Cooper patented two inventions in the late 19th century for the benefit of the railway industry. His first invention that he applied for a patent for whilst he was living in Western Australia in 1892 was the Spark Arrester for Locomotives (US468169A) which would stop sparks and cinders escaping a locomotive's smoke chimney, and therefore greatly reduce the risk of locomotives causing fires as it passed through land. This would have been very useful in the dry landscapes of Australia. His Spark Arrester invention resulted in his traveling around Australia to help develop it further, and also to witness it in action within steam locomotives. He is credited as having a role as a manager during the construction of the Midland Railway Company line in Australia. Above: Charles Cooper, in hat, peeping over a locomotive engine that uses his 1892 'Spark Arrester' invention. The second invention, which he applied for a patent for having returned to London during 1899, was a Smoke Consuming Apparatus for Steam Boiler and other Furnaces - patent number GB189909701(A). Its design helped to regulate the temperature equally throughout furnaces and boilers. 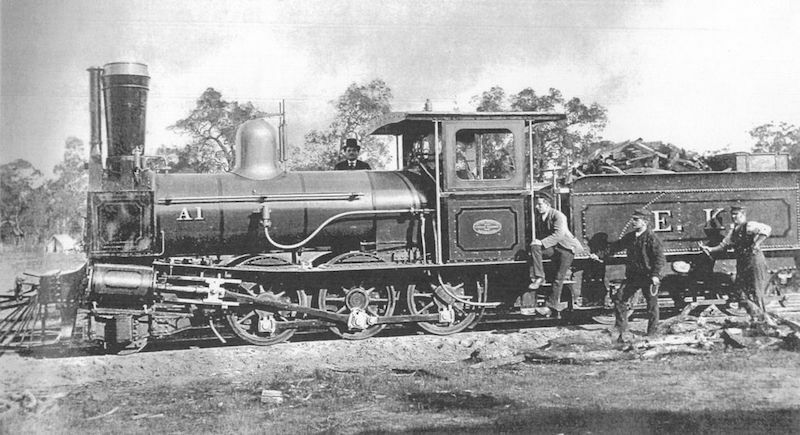 Charles' son Arthur Edward Cooper would take up a role as an Engine Driver in Western Australia. Notes of his family's life in Australia are filed with the State Library of Western Australia, and I'd love to read them. The Cooper surname is an occupational surname which according to John Ayto's Encyclopedia Of Surnames (2007), derives from the Middle English term 'coupe'. This originated from the trade of a cooper - the name given to someone who makes barrels, and who was once a common sight in villages and towns alongside the likes of blacksmiths. Whilst my research will need to expand somewhat before I reach far enough back in history, I've yet to identify a barrel maker in my family tree.